Singing sand, whistling sand or barking sand is sand that produces sounds of either high or low frequency under pressure. 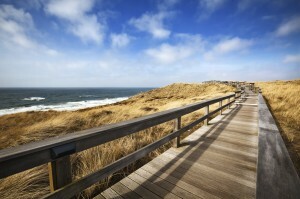 The sound emission is usually triggered by wind passing over dunes or by walking on the sand. The sound is generated by shear stress. One morning, when Gregor Samsa woke from troubled dreams, he found himself transformed in his bed into a horrible vermin. He lay on his armour-like back, and if he lifted his head a little he could see his brown belly, slightly domed and divided by arches into stiff sections. A collection of textile samples lay spread out on the table – Samsa was a travelling salesman – and above it there hung a picture that he had recently cut out of an illustrated magazine and housed in a nice, gilded frame. It showed a lady fitted out with a fur hat and fur boa who sat upright, raising a heavy fur muff that covered the whole of her lower arm towards the viewer. Gregor then turned to look out the window at the dull weather. What’s happened to me? He must have tried it a hundred times, shut his eyes so that he wouldn’t have to look at the floundering legs, and only stopped when he began to feel a mild, dull pain there that he had never felt before. He must have tried it a hundred times, shut his eyes so that he wouldn’t have to look at the floundering legs, and only stopped when he began to feel a mild, dull pain there that he had never felt before. “Oh, God”, he thought, “what a strenuous career it is that I’ve chosen! Travelling day in and day out. Doing business like this takes much more effort than doing your own business at home, and on top of that there’s the curse of travelling, worries about making train connections, bad and irregular food, contact with different people all the time so that you can never get to know anyone or become friendly with them. It can all go to Hell! ” He felt a slight itch. What’s happened to me? he thought. It wasn’t a dream. His room, a proper human room although a little too small, lay peacefully between its four familiar walls. A collection of textile samples lay spread out on the table – Samsa was a travelling salesman – and above it there hung a picture that he had recently cut out of an illustrated magazine and housed in a nice, gilded frame.